The widespread angst and disbelief around Alen Stajcic’s sacking has subsided with lofty expectations of glory building again around the Matildas ahead of the 2019 Women’s World Cup in France. Last month’s Cup of Nations triumph, albeit against average opposition, lifted the mood and gave new boss Ante Milicic a positive start, but Friday’s (12:30pm AEDT) friendly against USA in Denver is a different challenge altogether. Australia may have good recent memories against the USA, knocking them off in the 2017 Tournament of Nations before lifting the trophy and with the hosts needing a last-gasp Lindsay Horan goal to salvage a 1-1 draw at the same event last year. However, Team USA are currently the world number one women’s team and the current favourites, alongside hosts France, to hold aloft the silverware in Lyon on July 7. Milicic has never had the liberty of time as Matildas coach and this will test him and his side, even if the mantra is “we’re building for the World Cup”. What’s more important: result or performance? This match marks the Matildas’ final encounter before Milicic names his squad for the pre-Women’s World Cup training camp in Turkey. The benefit of a good win will be huge for the squad’s confidence as they adjust to their new boss and system. But it is still early in Milicic’s reign and this side would easily be forgiven for a defeat given the circumstances and quality of the opposition. Most pertinent will be signs of Milicic’s stamp being put on the playing style. Right now we want to see the players being receptive to his direction, and ideally glimpses that that will lead to this side being better and stronger in June. Some grace will be offered given the Matildas are up against the top-ranked side in the world. But as has been said numerous times by the players, the Matildas will need to beat the best at the Women’s World Cup, so we need to see signs that they’re capable against the USA on Friday. Can Sam Kerr perform & lead the way as captain? There’s no disputing the 2018 Ballon D’Or finalist’s on-field quality but for the first time against top 10 opposition Sam Kerr will lead the Matildas as captain. Is it a burden on her performance or will she thrive in the responsibility? The Perth Glory forward appeared to have no major issues with the added responsibility during last month’s Cup of Nations where she scored three goals and led the side to lift the trophy. But it’s a juggling act and that becomes tougher when you play top opposition and tough defenders like Becky Sauerbrunn. And it’s something she’ll need to get use to, ahead of the Women’s World Cup in June. In many ways, this is an ideal dress rehearsal for the 25-year-old, who is currently a leader by example, but evolving into much more of a vocal influence. Ahead of Friday's friendly vs USA, @SamKerr1 says "we need to stick to our style which we think will win us the World Cup!" Who can bolt into World Cup contention? Milicic’s squad in the USA contains two uncapped players in goalkeeper Teagan Micah and Sydney FC defender Elizabeth Ralston, while 16-year-old Mary Fowler only has three international appearances to her name and has only just returned to the national fold after a backflip. The Matildas boss has guaranteed Fowler game-time and if she performs well, it may confirm Michelle Heyman’s Women’s World Cup fate. Opportunities will be afforded with Milicic unwilling to risk vice-captain Steph Catley, defender Laura Alleway and forward Chloe Logarzo due to minor injury concerns. Atletico Madrid midfielder Alex Chidiac remains in Spain, while Kyah Simon continues her ambitious bid to return from injury in time for the Women’s World Cup. There’s a lot of experience in this squad and arguably 20 mainstays whose Women’s World Cup tickets are practically booked. But there’s a handful of spots still open and under a new coach, you just never know. Ben is a freelance Australian football writer, with experience with publications such as FourFourTwo, FTBL, The World Game, British Football Week, The Roar and SportsPundit. 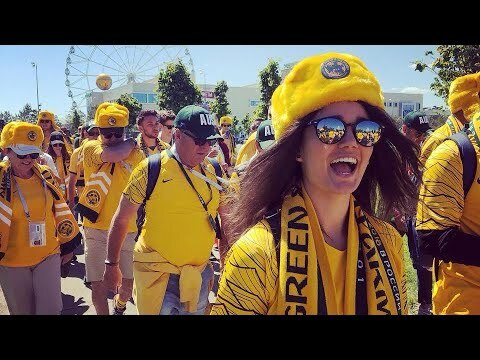 He specialises on anything related to Australians playing abroad from Europe to Asia and has travelled to both Brazil and Russia for the past two World Cups to watch his beloved Socceroos.